Hi! 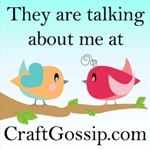 I'm Jenna from SewHappyGeek. Bonnie and I met when our tutorials were ripped off because she very kindly tracked me down and let me know 'Mary' was infringing on my copyright. She has quickly become a good friend. She even joined my Mug Rug Swap v.2! So this mug rug is the perfect guest tutorial, right? If you like this tutorial, please visit my Tutorial page to see my other tutes. Anyhoo, I’ll get you started, ok? 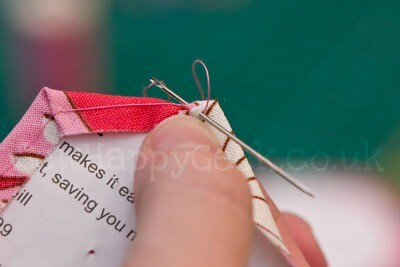 First of all, you’ll need to cut out your hexies, both paper and fabric. 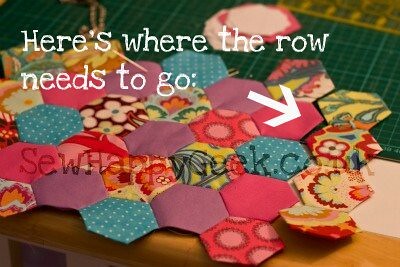 I use these Clover templates, tracing the ‘inner’ hexagon onto paper, and the ‘outer’ onto fabric. Then I cut them all out. 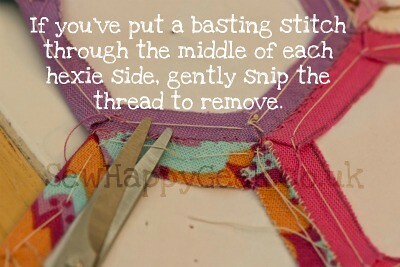 When you have them all basted together you simply snip the threads and those tiny stitches will come out just fine. For this mug rug you’ll need 31 hexies. 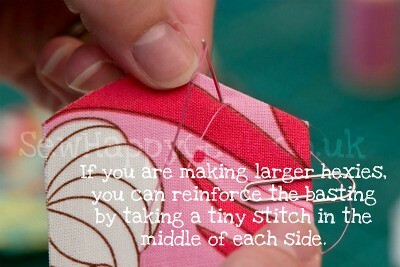 Once you have them all laid out, you can start stitching them together. I’ll warn you, this stage isn’t quite as fun as basting them, but you will be very proud when you get it done. And then you’ll probably start another. I pressed all mine before joining them so the folds were nice and straight. Once you get done with the first side of the top hexi, readjust the whole thing so you can stitch the next sides together, and so on all the way down to the bottom. 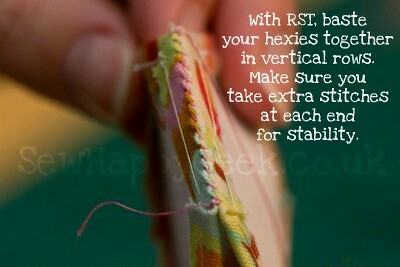 I recommend you join them together in rows of two, then stitch the rows together. The other basting threads can stay in. Baste and quilt as desired. 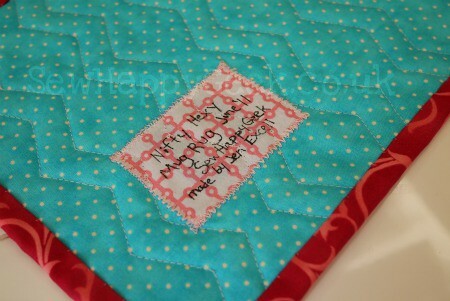 I quilted 1/4" along the vertical seams. 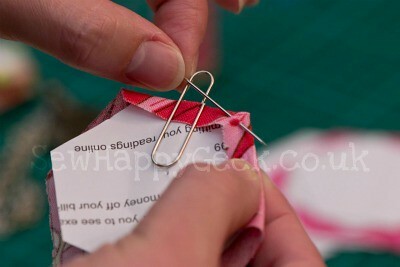 Now you just need to bind it, and I have a tutorial for that too: SewHappyGeek binding tutorial. And if you make one, I’d be thrilled if you add it to the SHG Flickr page! 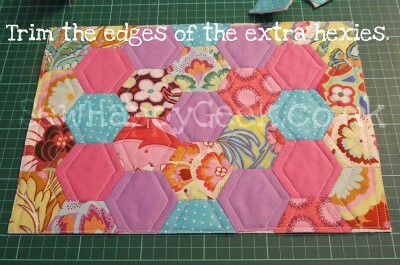 Thank you Bonnie for featuring me, and thank you all so much for reading my Hexagons for the Paranoid Mug Rug Tutorial! 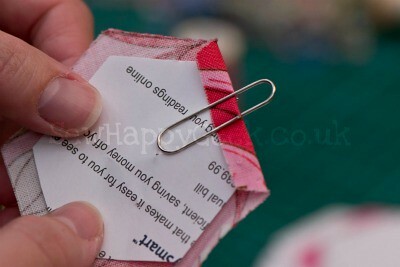 All Photos and Tutorial: © Copyright J C Excell, 2011. 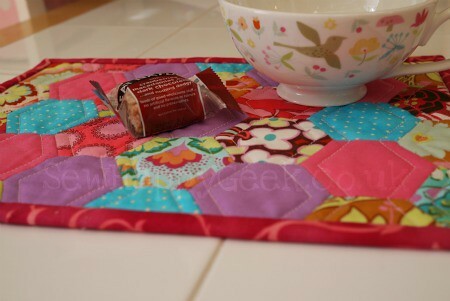 You are welcome to use any SewHappyGeek tutorial for personal use. You are even welcome to make a couple to sell, but you are not given permission to use my pictures or my words without giving me credit and linking back to the original. Sometimes my pictures have my family in them and they are never intended for public use. Also, I work very hard to provide free tutorials for my lovely readers, and anyone copying or selling my tutorials is guilty of copyright infringement. Totally cute! 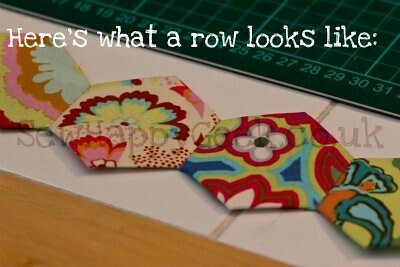 I love doing hexies! I can't wait to give it a try. :D I need to get over my aversion to hand sewing. This is too cute and I must do it! I agree, Bonnie. These are so cute and colorful, I will have to give it a try. Sounds like a great Christmas gift...a few of these to good friends! Thanks! 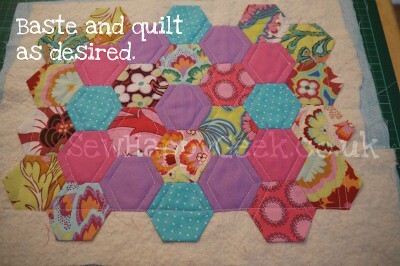 My name is Deb and I am addicted to hexagons. 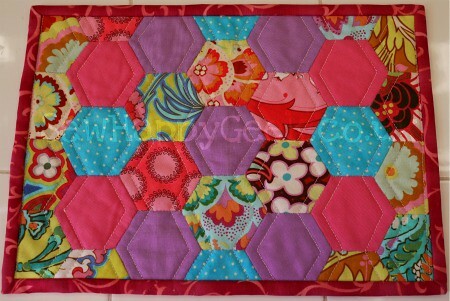 Thank you for providing one more project for me to make with hexies. I think I now have enough to last me through about age 127!! Fortunately, yours is a quickie...so I think I will bump it up on the list since it is more likely to actually get completed!! I'm very new at doing this, and have never done 'hexies' before. 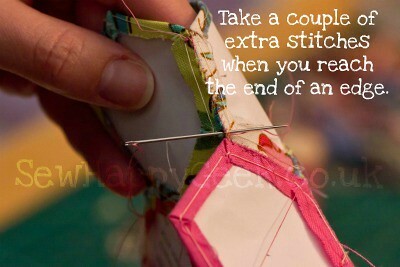 It looks interesting - a good way to use up scraps. I may try it, Lord willing, this weekend after I finish that apron. I just praise the Lord Jesus for His blessings, and finding these tutorials is just one of those blessing. Thanks so much!! 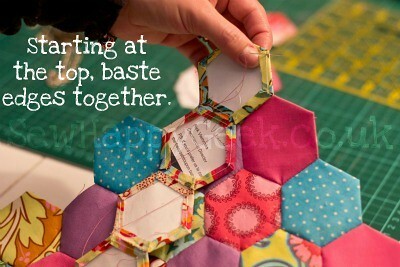 i just found this tutorial and it is the best hexagon paper piecing tute i have found!! thank you so much!! the pictures are great and you explained it so well! i am very excited to try my hand at this--but until i discovered this i was not sure exactly how to do it. thank you very much!!!!! Thanks so much for the tut. & free pattern. It makes it look so simple. Seven years ago my aunt died and left me an unfinished Grandmother's Flower Garden quilt. I never finished it because I didn't know if you were supposed to leave the papers in or take them out! Dumb, I know. Just seeing that one picture on this tutorial has pointed me in the right direction, finally! Thanks! This is quite nice. 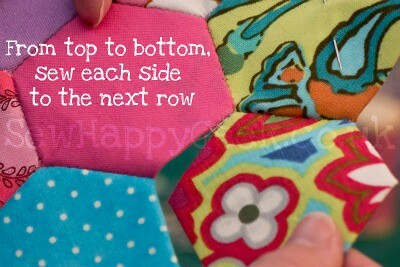 I've made a hexie flower grouping in a sample quilt that I did when I learned to make a quilt hand sewn. I had to mark the 1/4 inch seam and press the fabric in. 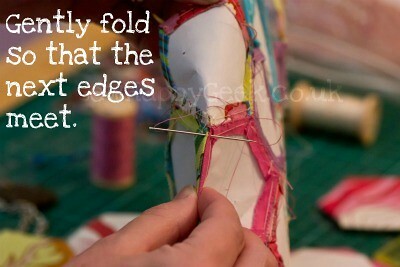 Then I went by the pencil lines to sew mine together. I just checked to see if I could pin from this post and her photos, and it worked fine for me! Are you using a computer directly, or an app? And which browser are you using? 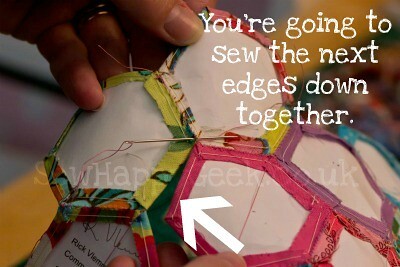 What size hexagons are you using? I can't see anywhere what size Hexagons you are using. The link to the template no longer works!